This system supports bluetoothr. Bluetoothr is a wireless data system that allows the cellular phone to wirelessly connect to the hands-free system and make/receive calls. Before making a phone call, check the connection status, battery charge, call area and signal strength. If a bluetoothr device cannot be connected, check the connection status on the phone screen. If the device is not connected, either register or reconnect it. 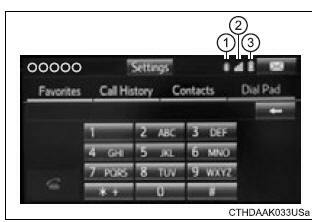 The vehicle�s built in microphone is used when talking on the phone. 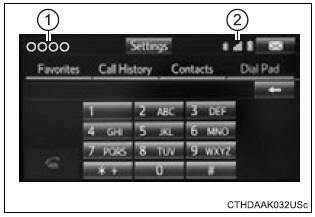 To use the hands-free system, you must register your bluetooth� phone in the system. You can check indicators such as signal strength and battery charge on the phone screen.